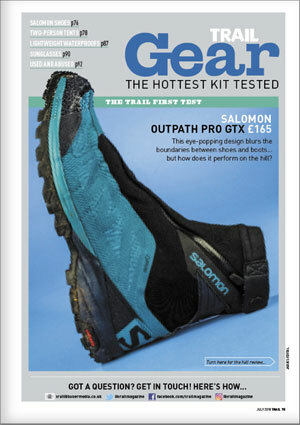 Comes with the FREE 2019 Trail Gear Guide! 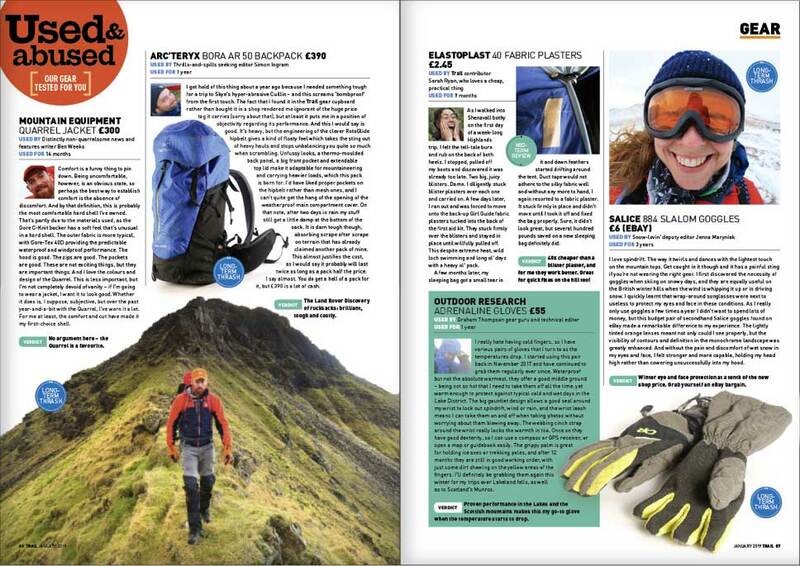 236 products reviewed & rated by mountain experts! 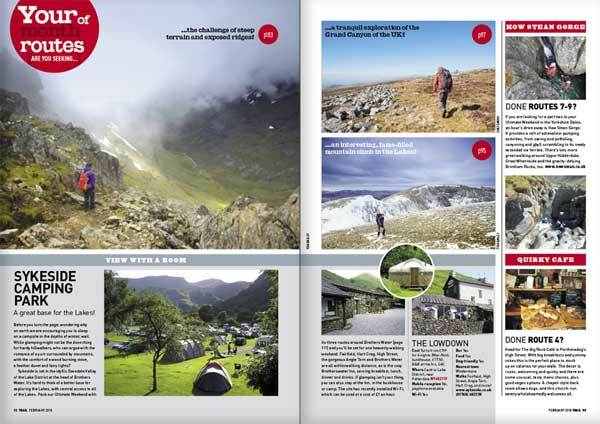 The Future Of Bothies - Are Britain’s mountain shelters under threat? 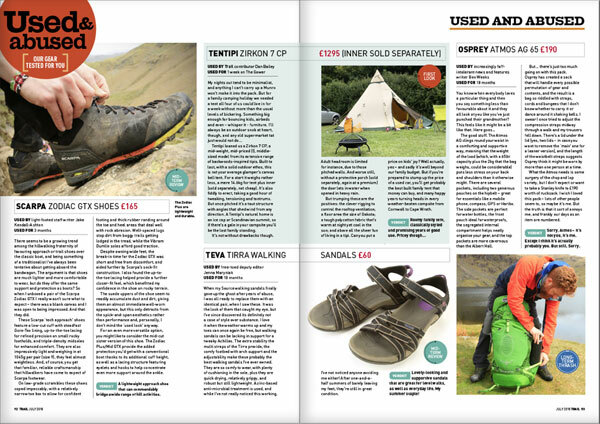 Summer Footwear - Mountain boots, trail shoes and sandals reviewed. 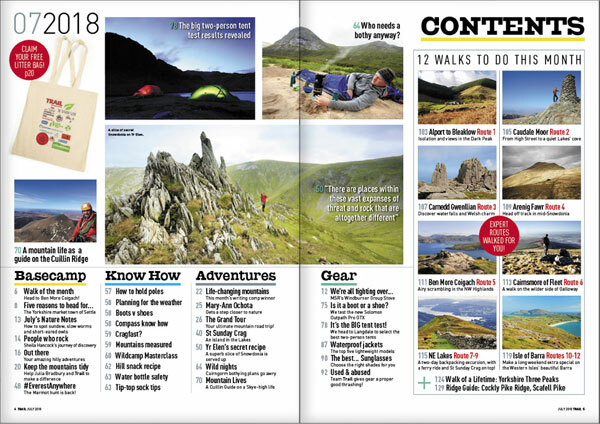 All of this and more can be found in the new May issue of the UK’s best-selling hillwalking magazine - on sale Thursday 18th April. 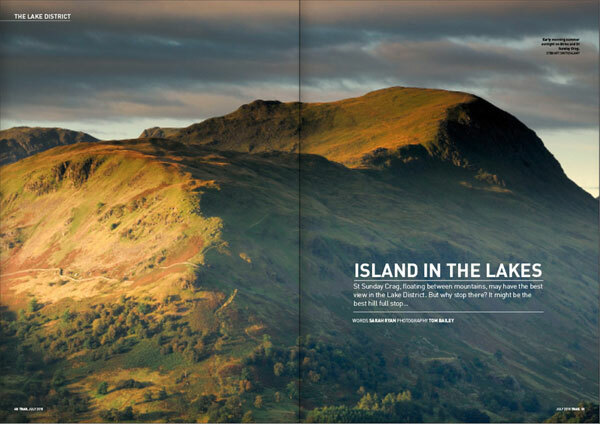 a tool to unlock Britain’s most hard-to-reach mountains. The theory sounds flawless, but does it stand up to the test? 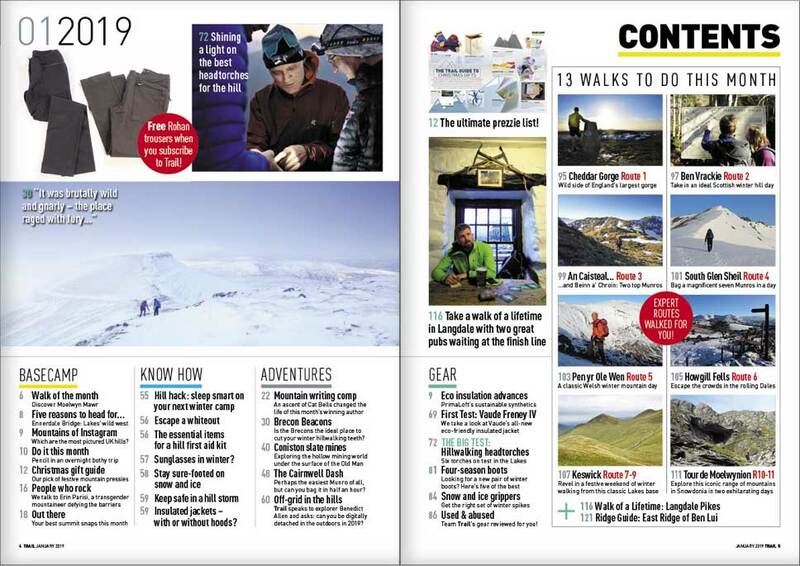 Trail heads for Scotland’s two most remote Munros to find out. Bivvying is the purest form of sleeping wild. 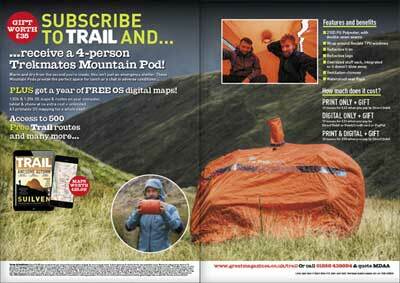 No tent, no protection except the waterproof bag you’re wrapped in, and nowhere to escape to if the weather turns. But if the weather doesn’t turn, this is an overnight experience like no other. 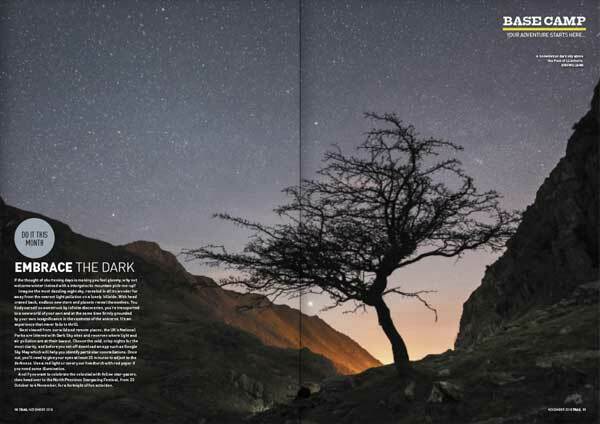 With a clear forecast and a starlit summit in mind, Tom Bailey left behind home comforts to spend a night on a favourite Lakeland fell. 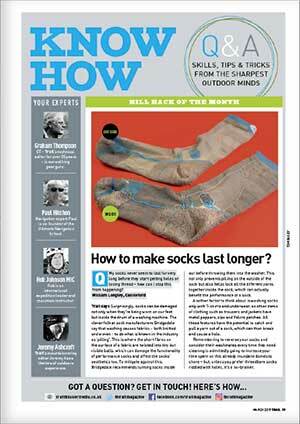 And once you’ve read about it, trust us, you’ll want to do the same. 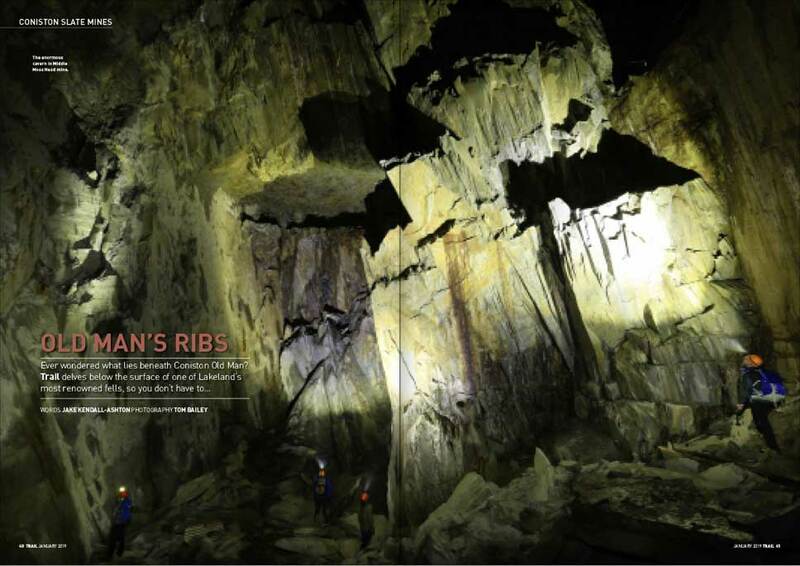 Honister Slate Mine’s history is founded in stone, but its future is being shaped by iron. 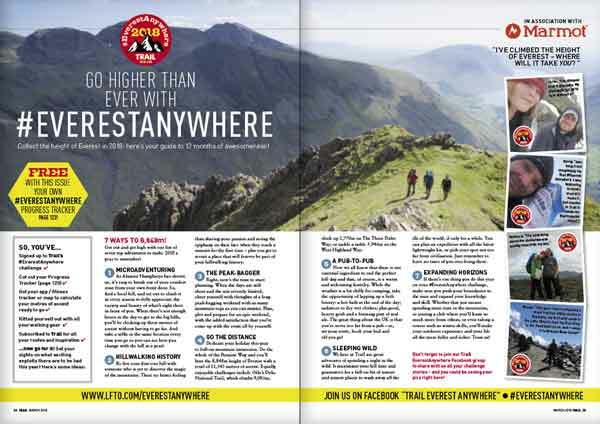 Trail clips in to the UK’s original via ferrata. Are Britain’s Bothies at Breaking point? The Mountain Bothies Association has been rebuilding, maintaining and repairing remote shelters in Britain’s wildest and loneliest regions for over 50 years. 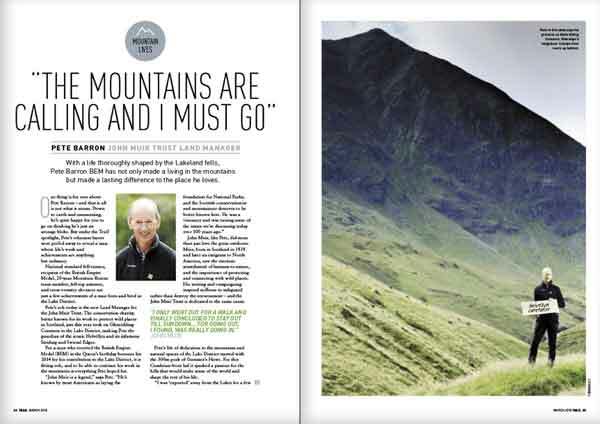 Today, with more bothies to care for and visitor numbers higher than ever, Trail speaks to four people whose working lives revolve around these iconic mountain shelters to better understand the threats facing them. 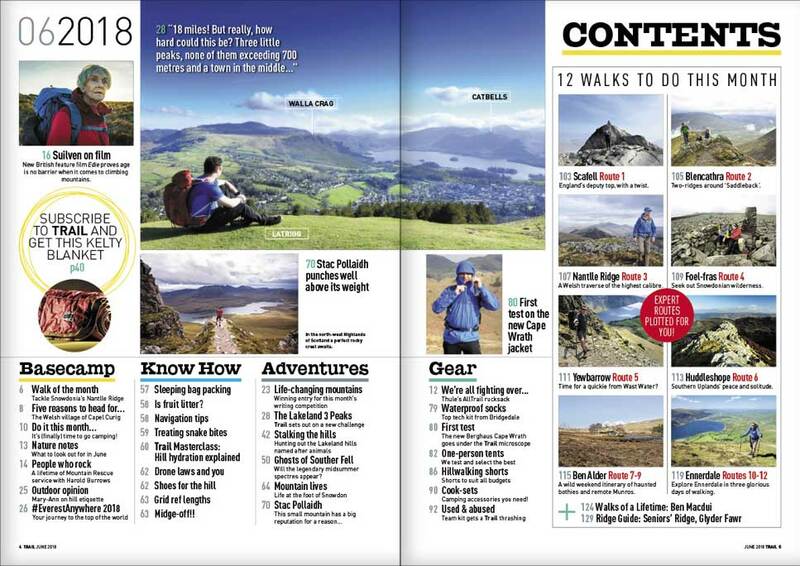 The British mountains are full of weird and wonderful lists for hillwalkers to spend a lifetime ticking off. But which is the right one for you? TheUK mountains you HAVE to climb this Spring! If you could choose one UK peak to climb once the clocks have spun back and the snows have started to retreat from the mountains, what would it be? 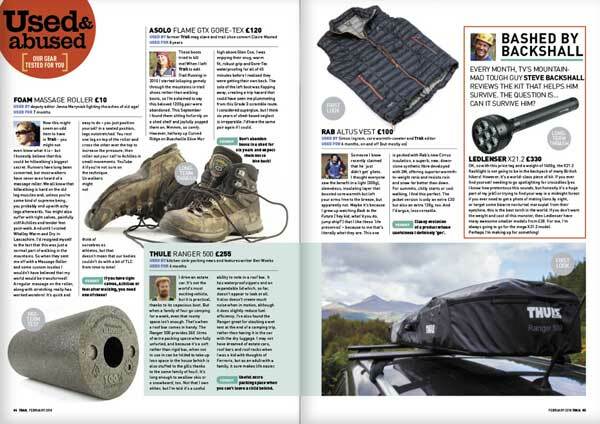 Spring’s almost here, so we’ve gathered a team of experts to reveal the summits they most want to stand on once winter releases its grip. 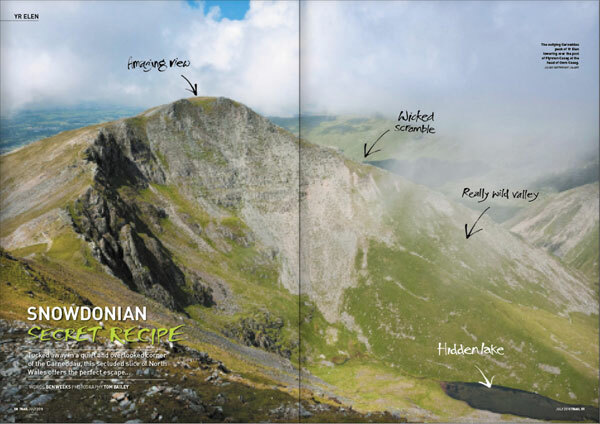 Add a dusting of snow to the Lake District’s Newlands Round for a high-level horseshoe that appeals to man and beast alike. 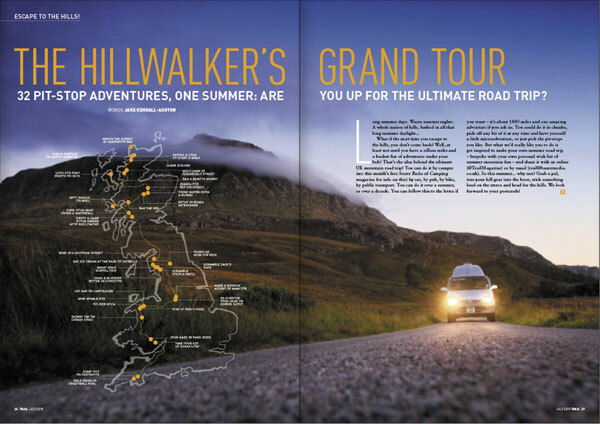 A photographic dedication of adoration to the most stunning landscapes in Scotland by Alex Nail. Being in the mountains is an immersive, sensory experience, and nowhere is this felt more keenly than the quiet corner of the Cairngorms occupied by Beinn a’ Ghlo. Mastering the art of winter navigation requires skill, confidence and experience, and Trail knows the perfect playground to practice. The Lake District in Winter! From wild corners to snowy edges - discover it your way! 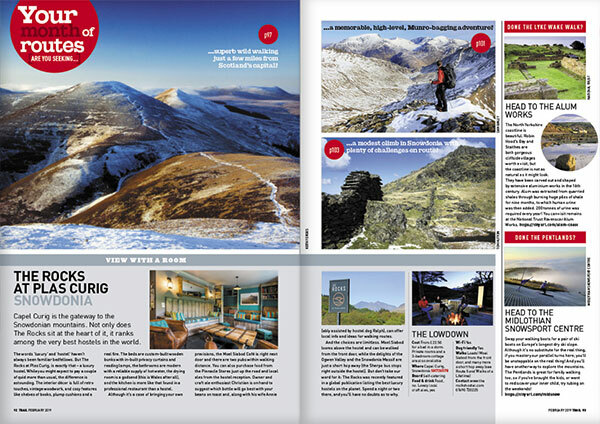 All of this and more can be found in the new February issue of Trail magazine - on sale Friday 28th December. 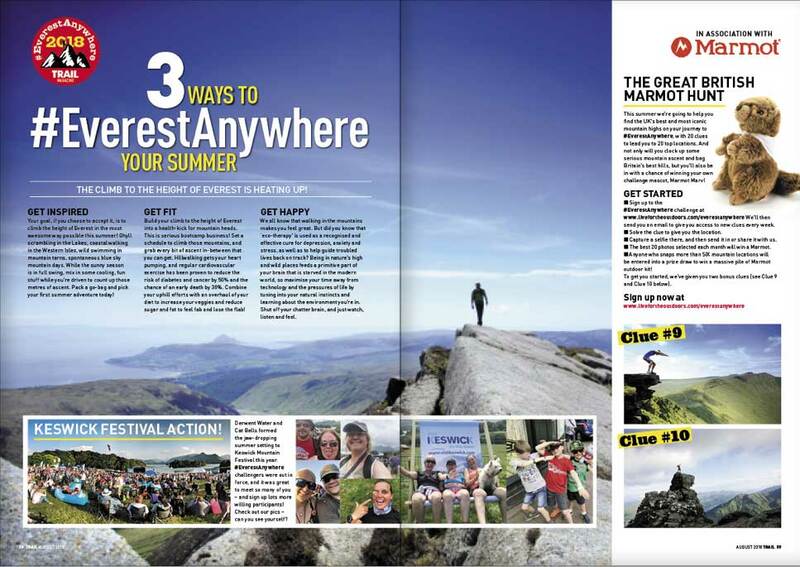 The Yorkshire Three Peaks: a trio of iconic summits within a sea of ragged moorland. It’s completed by thousands in summer, but how hard is this famous challenge when dictated by winter rules? A love of the mountains is not always a straightforward affair, and a fear of heights can turn a magical experience into a hellish mangle of trepidation and panic. But there is an answer, and it’s a brain game that everyone can learn from. 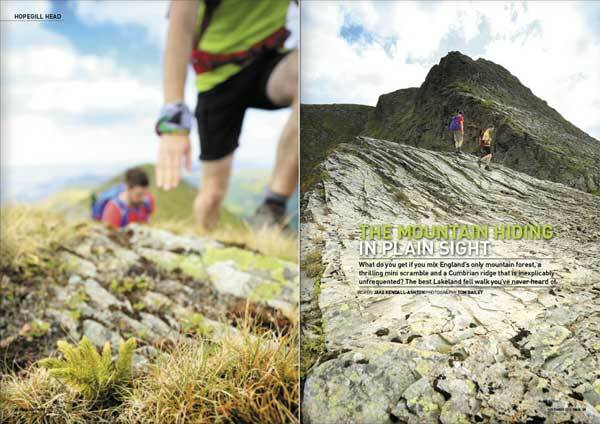 is Helvellyn’s finest as hard as it looks? 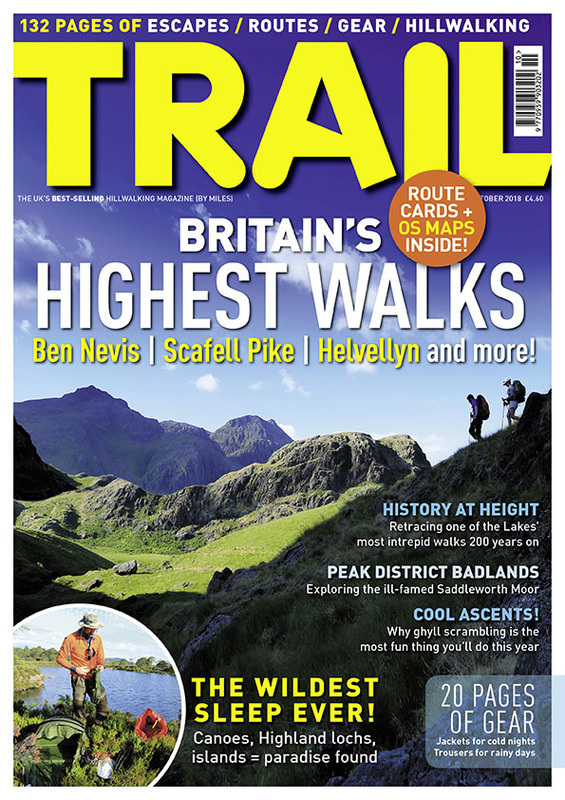 All of this and more can be found in the new January issue of Trail magazine - on sale Thursday 29th November. It’s not the highest, or most exciting, and it’s certainly not the prettiest mountain. 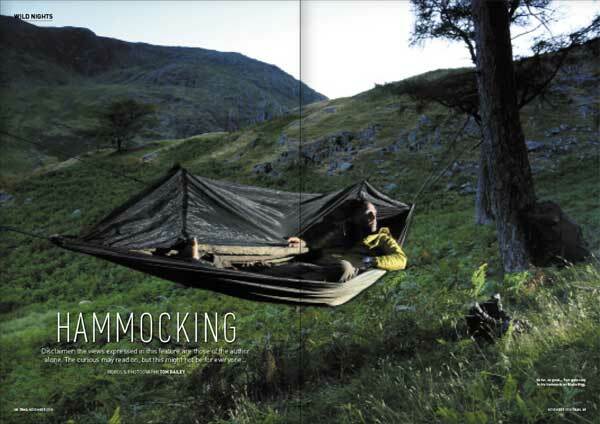 But if you’ve a little over half-an-hour to spare and are looking to bag a Munro, The Cairnwell is perfect. Mobile coverage is getting better. 4G is making the mountains more accessible than ever. Reliable communication, increased safety, greater connectivity with those at home. 2019 might be the last year you can be involuntarily off the grid in the hills. But is that a good thing? 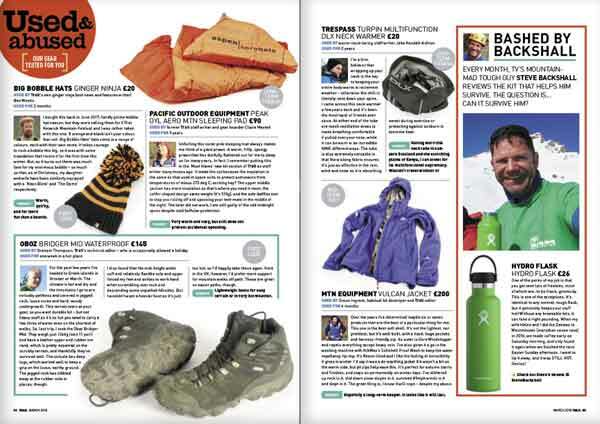 All of this and more can be found in the new December issue of Trail magazine - on sale Thursday 1st November. 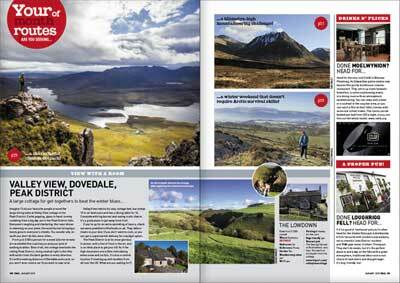 Read ‘Cuillin’, and you probably think of Skye. But Rùm has a Cuillin range of its own, steeped in Norse history, natural wonders, unique geological curiosities, and mountain adventures of the purest kind. Twice a day off the Swansea coast a wild peninsula is scythed from the mainland and a tidal island of limestone crags, golden beaches and Stone Age caves is born. Now imagine having that entire place to yourself for one night only. 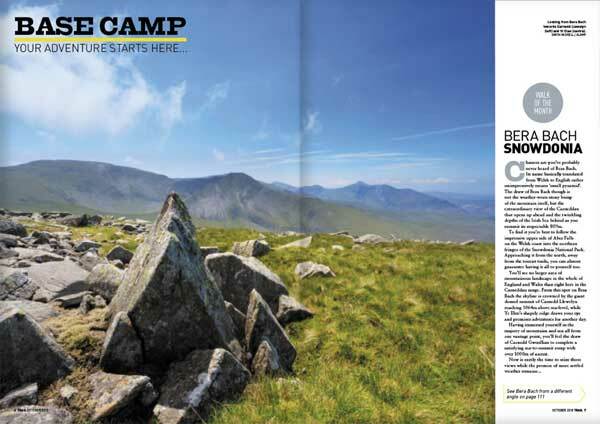 Snowdonia Slate Trail: your next big walk! 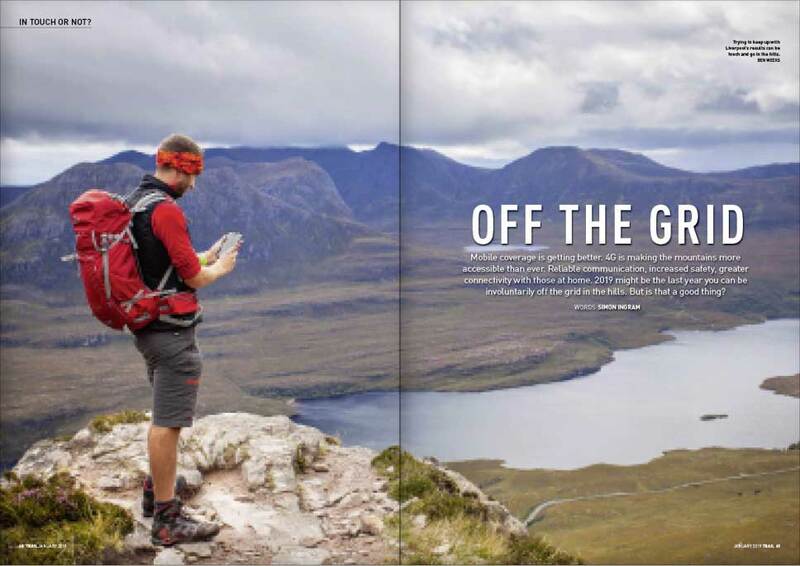 6 hands-on scrambling routes from easy to mind-blowing all with os maps! 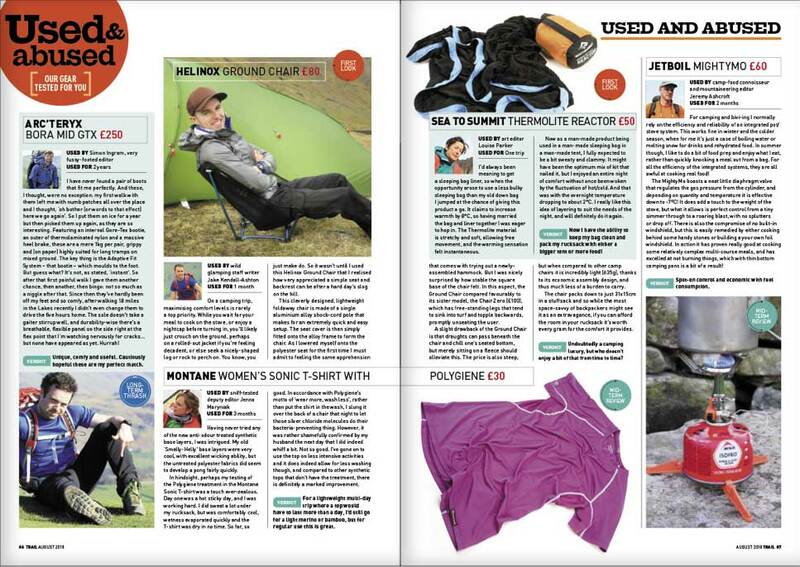 All of this and more can be found in the new September issue of Trail magazine - on sale Thursday 9th August. 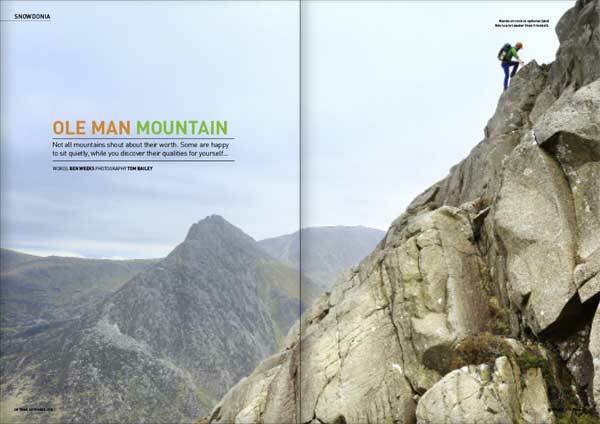 Ragged, razor-sharp and – if reputation is to be believed – risky, the ridge of Crib Goch is a polarising place. 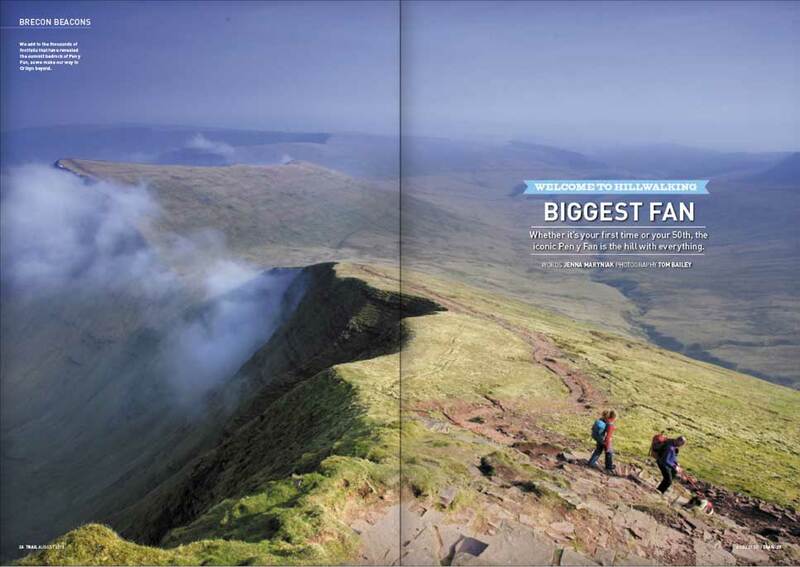 From the perfect first hill to the toughest challenge out there - why Brecon Beacon icon Pen y Fan truly has it all. 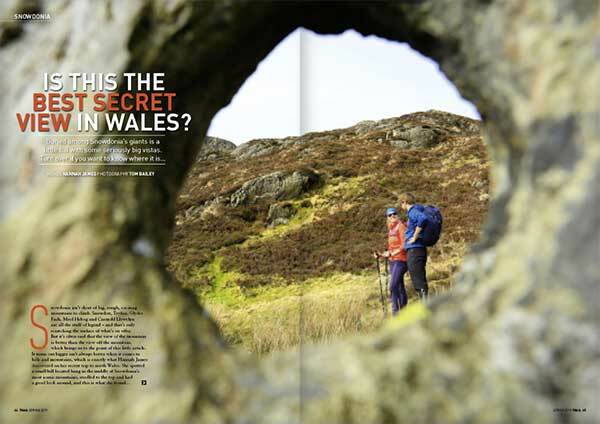 Escape the crowds - the secret to getting the best routes to yourself... every time. Your kid's first hill - ideas, locations, and tips to make that first mountain epic. 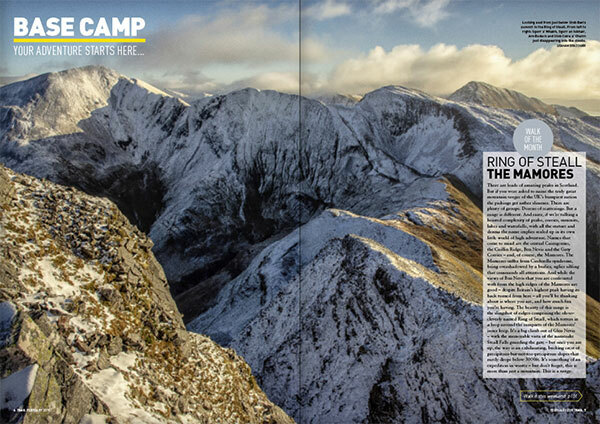 Scrambling on Arran - risk, reward and what you can learn about yourself on the way. 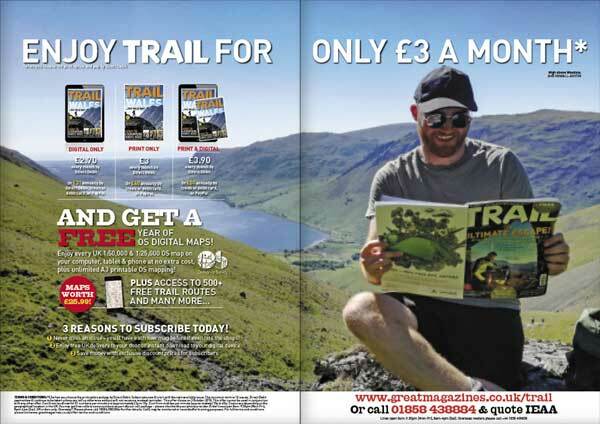 All of this and more can be found in the new August issue of Trail magazine - on sale Thursday 12th July. 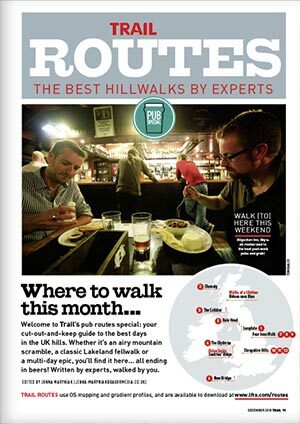 Whether it's your first time or your 50th, the iconic Pen y Fan is the hill with everything. 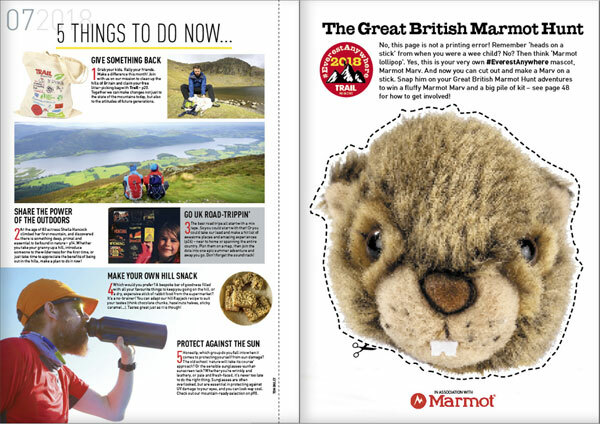 How to make a child's first hillwalk set the scene for a lifetime of adventure (with a little help from hopes, promises, bunnies and poo). 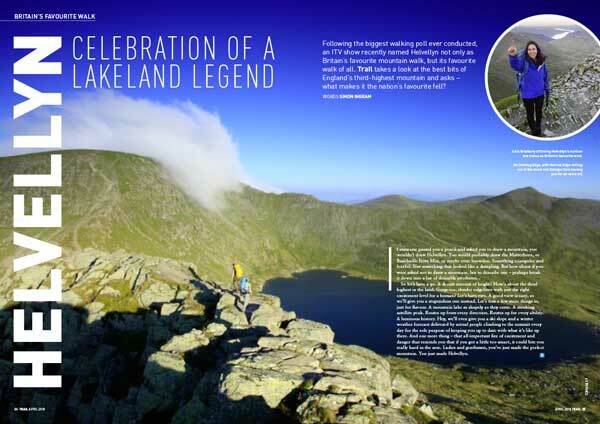 Helvellyn - discover the mountain that won the nation's vote! 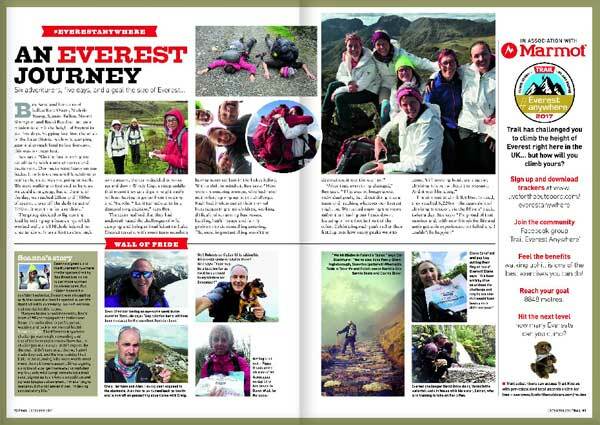 Could you do Striding Edge? 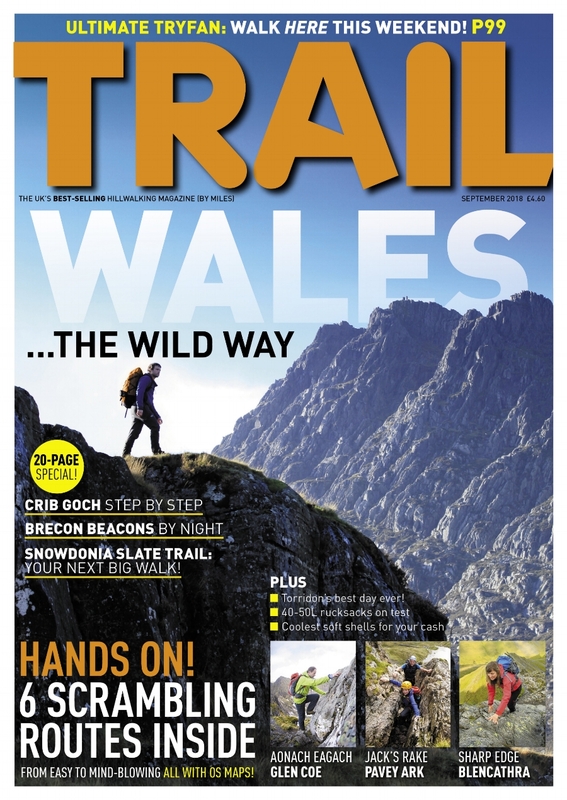 All of this and more can be found in the new April issue of Trail magazine - on sale Thursday 22nd February. 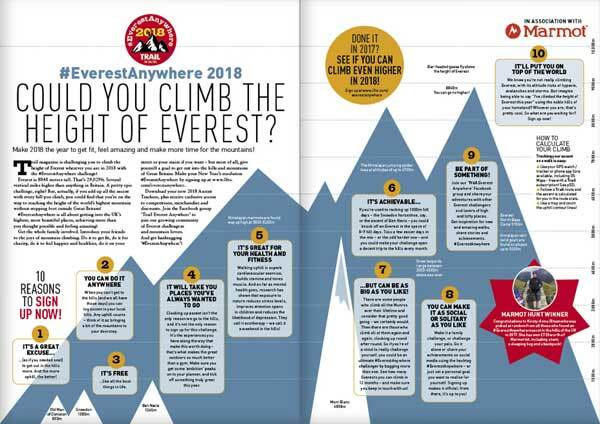 Following the biggest walking poll ever conducted, an ITV show recently named Helvellyn not only as Britain's favourite mountain walk, but its favourite walk of all. 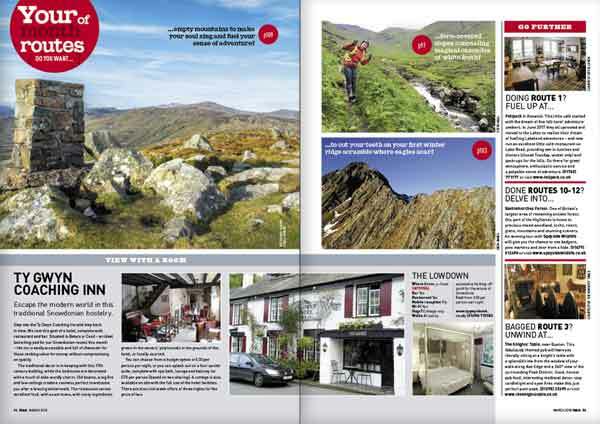 Trail takes a look at the best bits of England's third-highest mountain and asks - what makes it the nation's favourite fell? 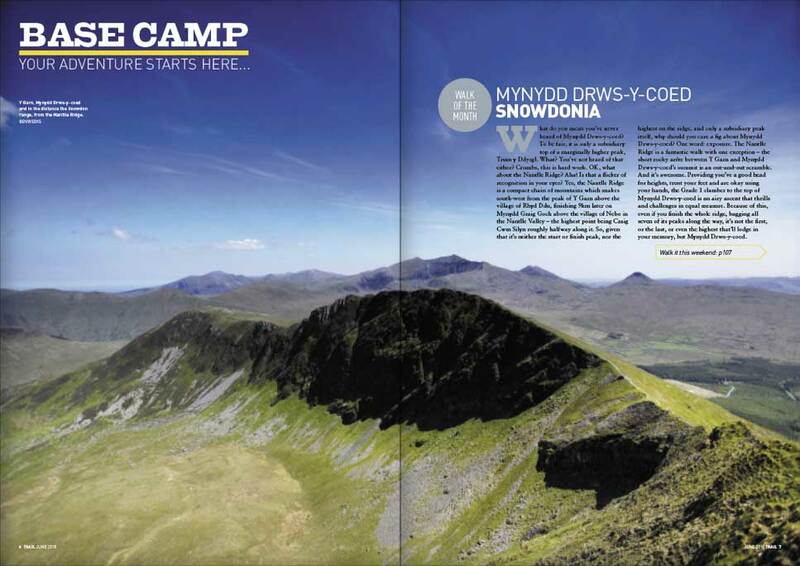 Firmly in the shadow of other celebrity Snowdonian peaks, the gaze of the masses is blinded to Moel Siabod, but occasionally it's the little stars that shine the brightest. New year, big dreams, more mountains! 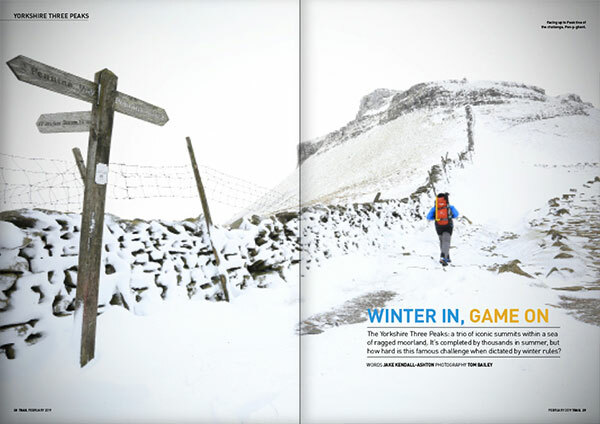 Scafell - England's highest scramble... in winter. Camping in winter - Totally bonkers or seriously worth it? 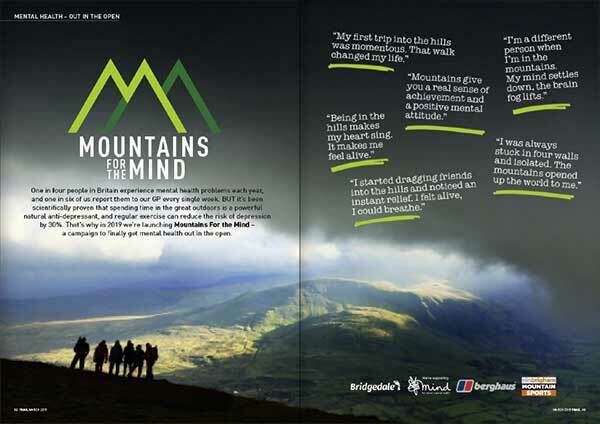 John Muir Trust - Getting to the heart of the trust on Helvellyn. 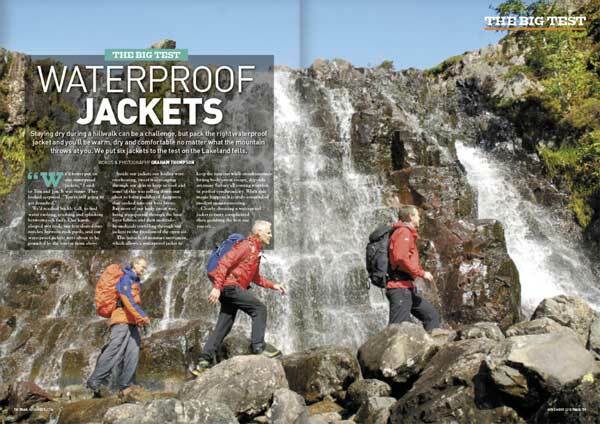 Gear on test - hi-spec rucksacks and cosy fleeces. 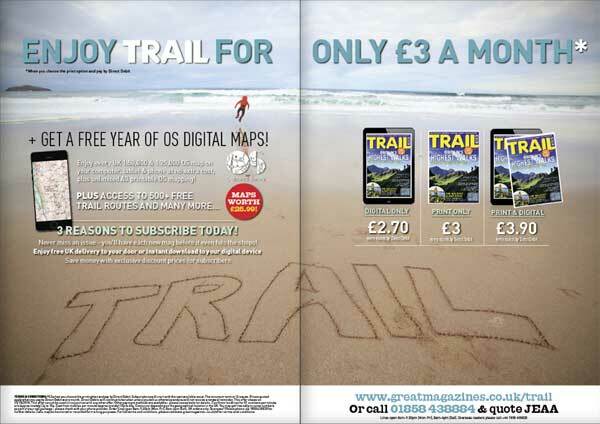 All of this and more can be found in the new March issue of Trail magazine - on sale Thursday 25th January. 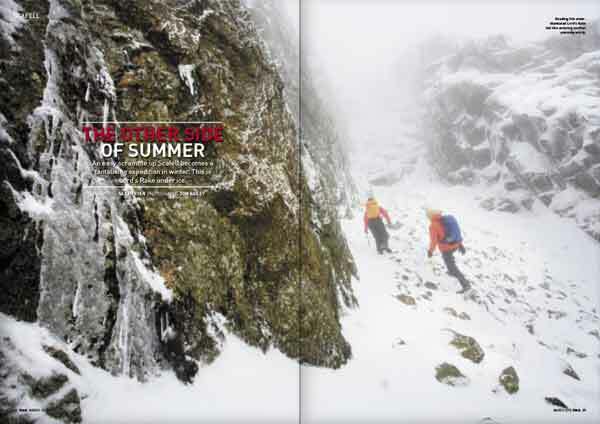 An easy scramble becomes a tantalising expedition in winter. This is Lord's Rake under ice. 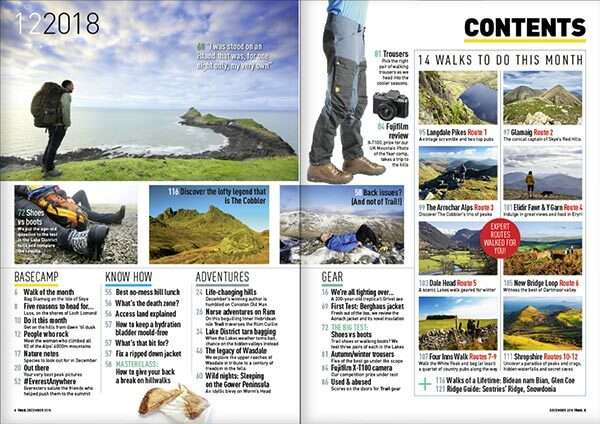 Whether you're a newcomer looking for a fasttrack to a hill walking life list worthy of teh best or simply want a cool 'List of Things to Do in 2018', here's a ready-made hillwalking CV just waiting for your boots! 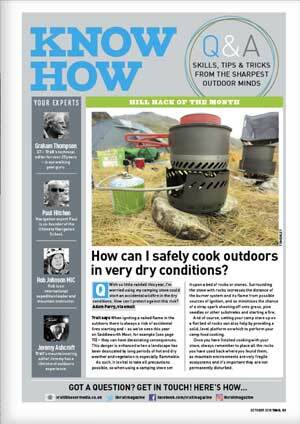 Winter wild camping... how hard can it be? The most northerly point of Scotland is not John o'Groats. 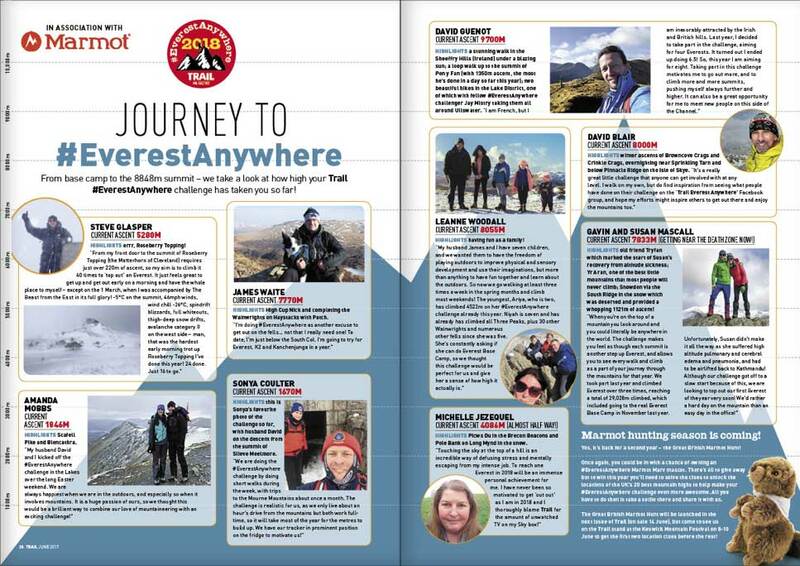 Trail goes to the very top of Britain and asks, "When it comes to cardinal extremes, where's the point...?" 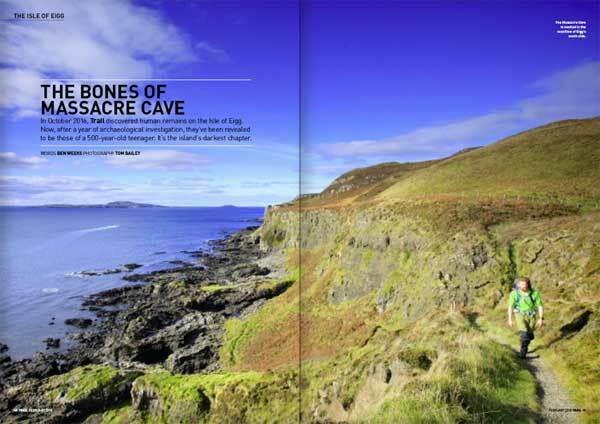 The Massacre Cave - Trail unearths history on the the tiny Scottish island of Eigg. Andy Kirkpatrick's Psycho Vertical film reviewed. 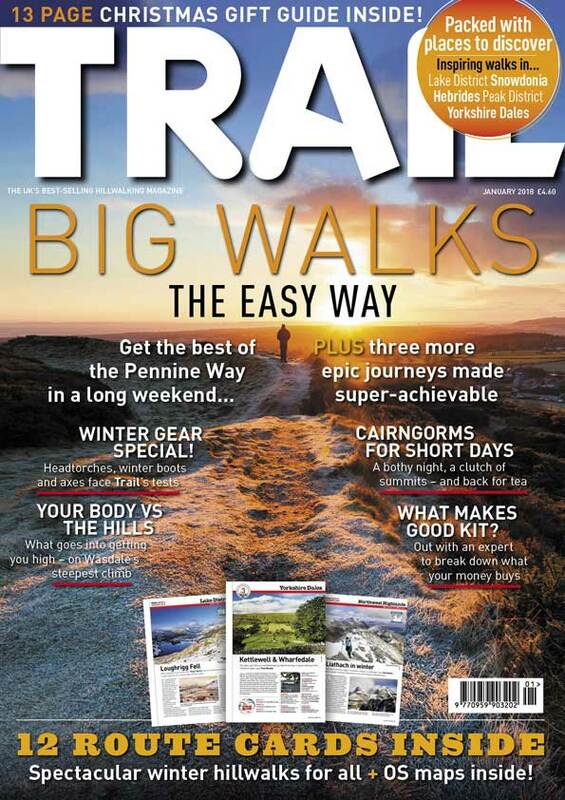 All of this and more can be found in the new February issue of Trail magazine - on sale Thursday 28th December. 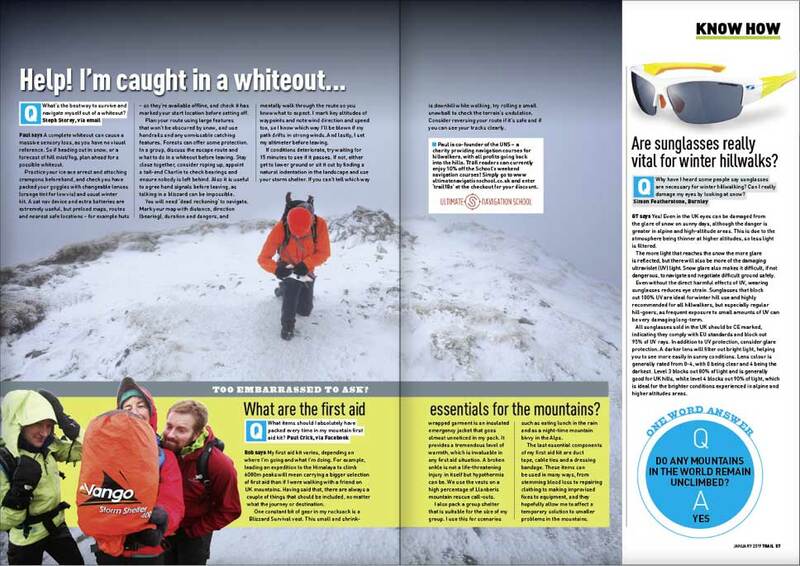 Full-on hill walking without venturing into a high, white wilderness? Here's how to pack six of the Peak's sharpest summits into one epic weekend. In October 2016, Trail discovered human remains on the Isle of Eigg. Now, after a year of archaeological investigation, they've been revealed to be those of a 500-year-old teenager. It's the island's darkest chapter. 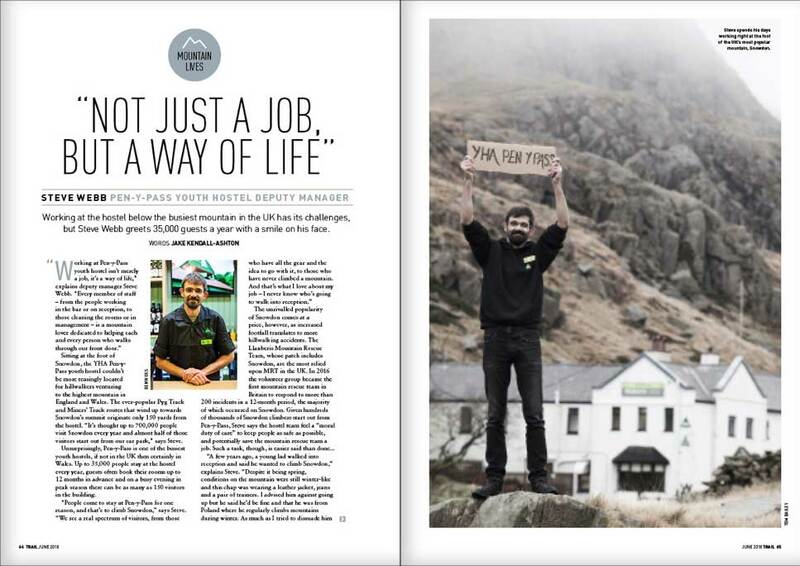 Making a living from a passion is a dream for most of us, bur for photographer Nick Livesey, the highest places of Wales became his saviour as well as his way of life. 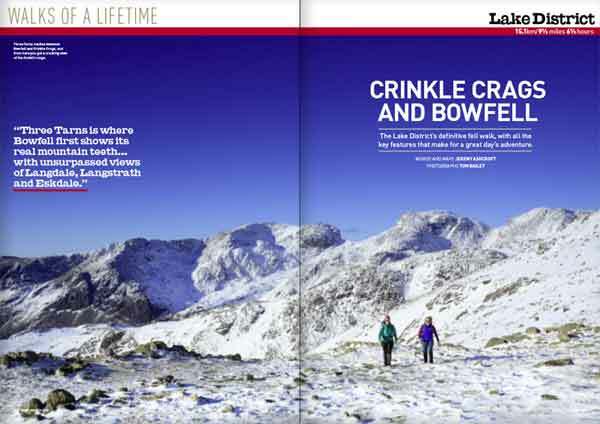 What do you get if you combine England's highest mountain with fresh snow and a full moon? A classic in the making. 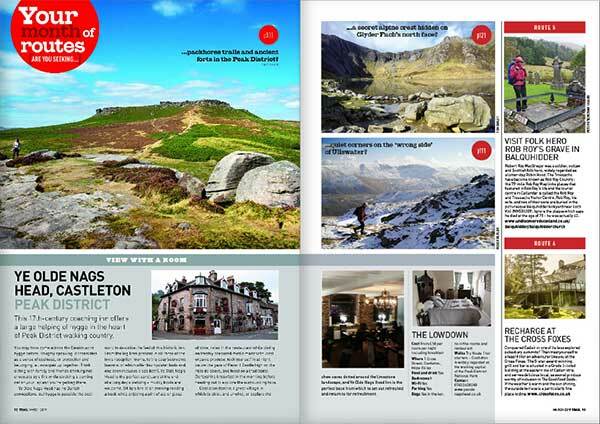 Get the best of the Pennine Way in a long weekend - plus three more epic journeys made super-achievable. 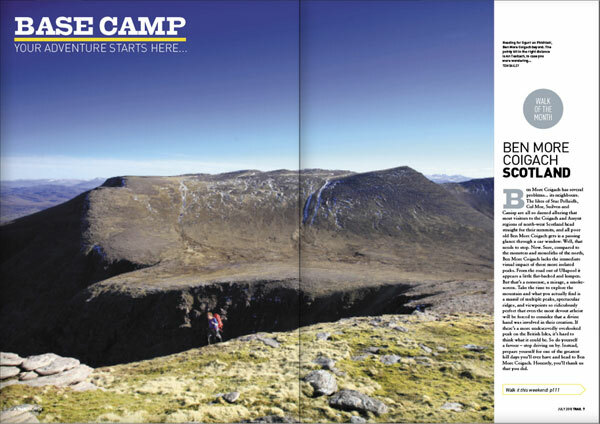 Cairngorms for short days - a bothy night, a clutch of summits, and back for tea. 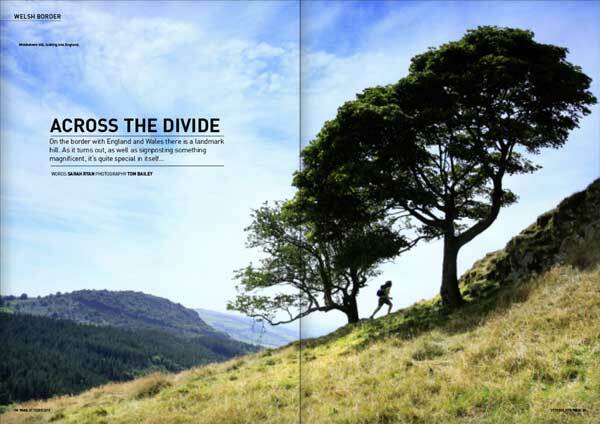 Your body vs the hills - What goes into getting you high on Wasdale's steepest climb. What makes good kit? Out with an expert to break down what your money buys. Winter gear special! 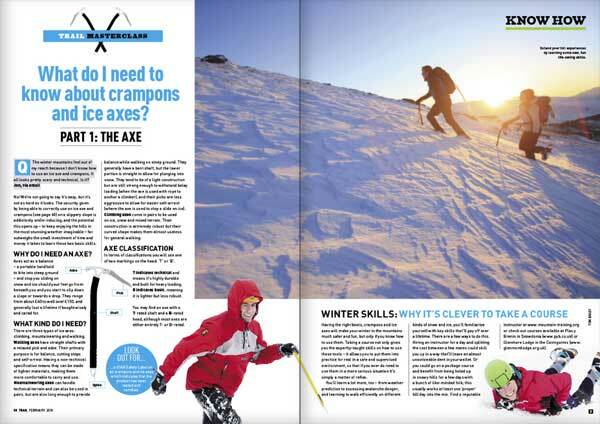 Headtorches, winter boots and axes face Trail's test. 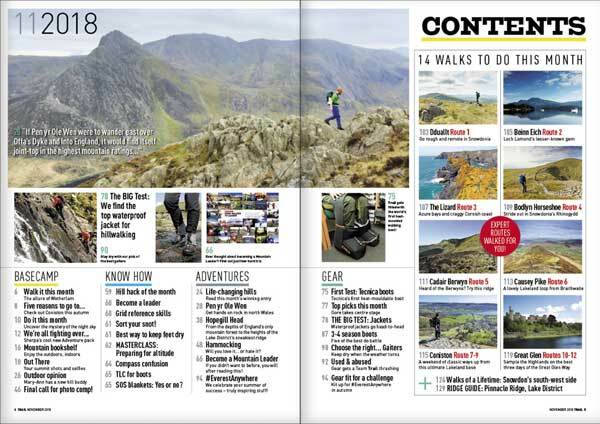 All of this and more can be found in the new January issue of Trail magazine - on sale Thursday 30th November. Short on time? 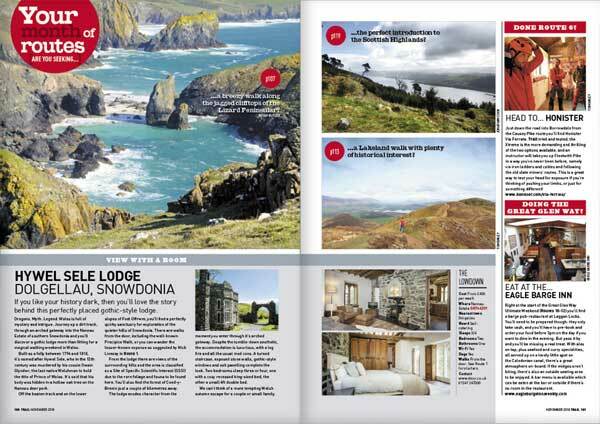 Just do the best bits of the UK's oldest long-distance path with Trail's take on an ultimate weekend on the 'Way. 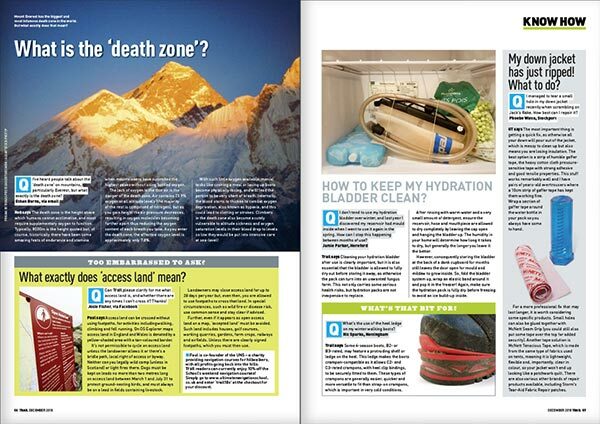 What happens to your body when you trek up a mountain? 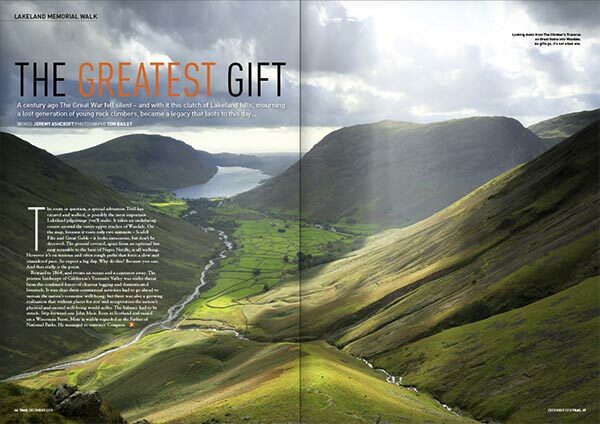 Sporting an array of gizmos and gadgets, human guinea pig Jack Hart sets off to the Lake District to find out. Where has the year gone? It's flying by! 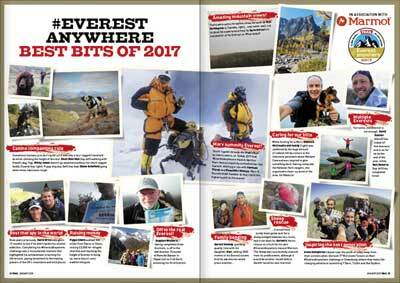 But despite the month written on the front of the latest issue of Trail, we've actually got a bit of 2017 left. 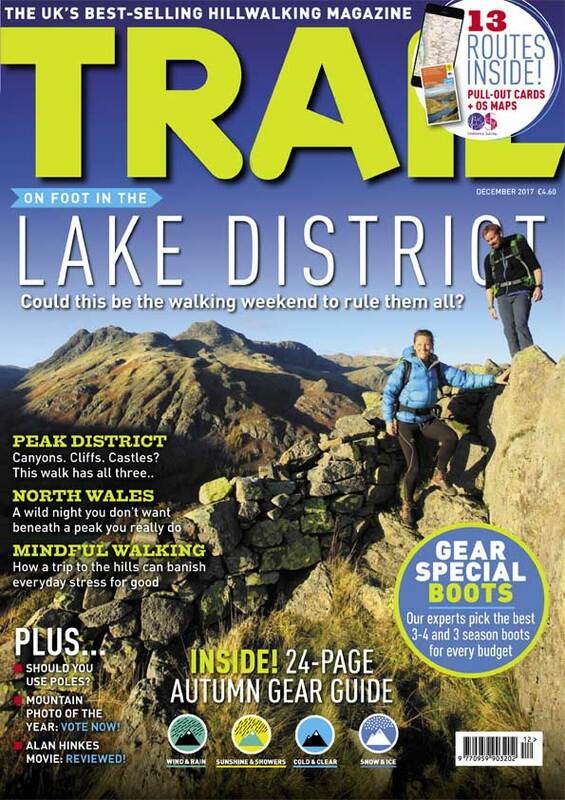 So, in the December issue you'll find Trail eeking the last drops of Autumn out of the year by dossing down in an iconic Lake District hostel in a wild valley, applying mindfulness to a day on the hills, breakfasting on a pointy Welsh peak and, umm, sleeping under a rock. 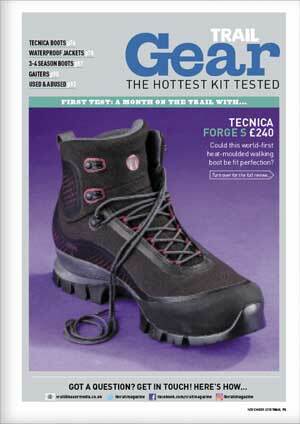 Plus there's a 24 page autumnal gear guide, the usual news, reviews and know-how, and 12 routes to walk this month. 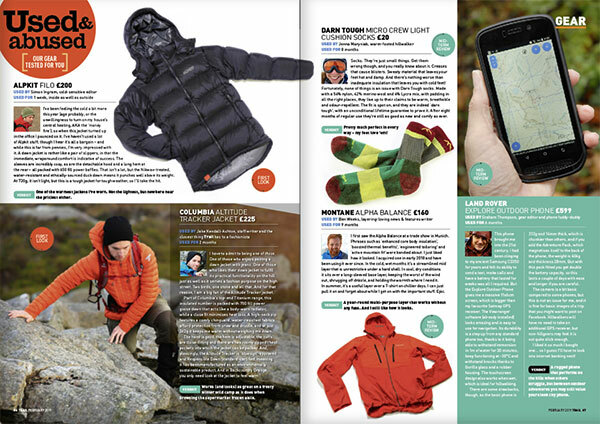 All of this and more can be found in the new December issue of Trail magazine - on sale Thursday 2nd November. 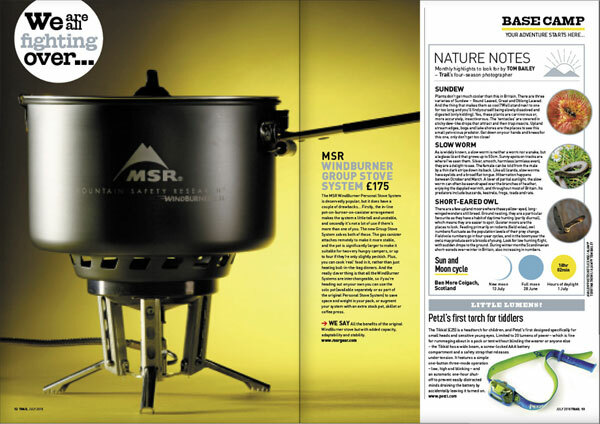 Invisible on the map, unexpected on the ground - and the perfect foil for a dodgy weather day in the Peak District. Could mindfulness really be the key to happiness and saving the planet? Trail investigates.